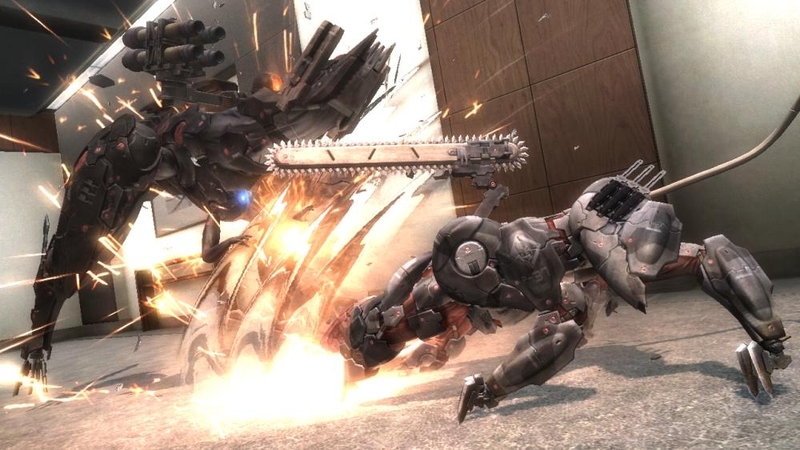 Like the Jetstream Sam DLC before it, Blade Wolf continues to build the lore surrounding the Metal Gear Rising world with another look at a side character. This time around we are treated to a behind the scenes glimpse at IF Prototype LQ-84i, also known as Blade Wolf. We visit the enemy-turned good guy before he meets Raiden but after he runs into Jetstream Sam – as witnessed in the previous DLC. So he’s still fighting for the bad guys but it is clear that his conscience is starting to get in the way. The story here is, once again, clearly not the main bullet point. You get to spend some time with a familiar face in Mistral and are introduced to a new character, Khamsin, although there is pretty much no interaction with him besides a fight. In reality the DLC really seems to just put an end cap on this chapter in Raiden’s tale, with a nice epilogue that sums up Raiden’s ideals and why Blade Wolf is fighting with him. Like in the Jetstream Sam DLC, you will traverse familiar areas from the main campaign and fight the same enemies. 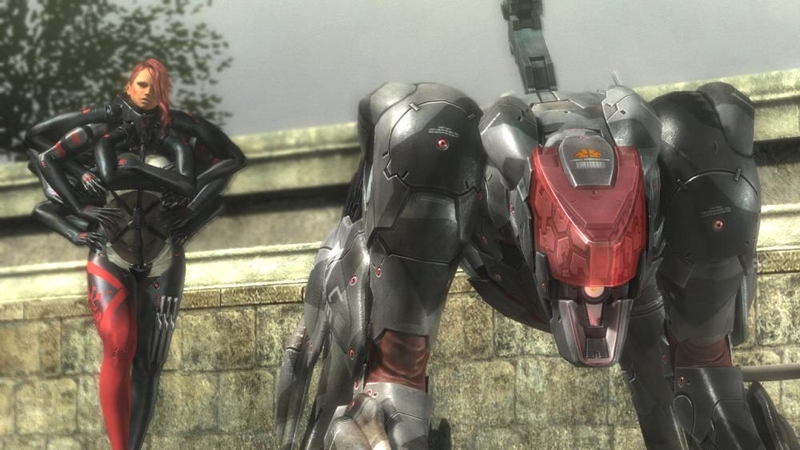 Blade Wolf controls exactly the same as Raiden but has a couple unique moves that you will certainly remember being used against you when you faced him in the campaign. In general Blade Wolf’s attacks are slower but appear to do more damage and stagger enemies more often. Unlike the last DLC, Blade Wolf does end with a completely fresh boss fight that is welcome after trudging through too familiar enemies. The only gameplay element that has been added for the Blade Wolf DLC besides the new boss is a couple platforming sections. I mean who doesn’t love platforming in third person action games right? These parts are pretty terrible but get a slight pass due to the most difficult section just jumping on elevated boxes with ground below them, meaning a missed jump only requires starting that section over again instead of the instant death that usually would accompany terrible platforming. The mechanics of leveling up and accessing VR missions are exactly the same as they were in the Jetstream Sam DLC as well. This means that Blade Wolf can find upgrades in the world and also can acquire them by defeating VR missions. Unfortunately these VR missions are still only accessible within the campaign and nowhere else, which also means that they drain your precious items. The Blade Wolf DLC comes in cheaper than the Jetstream Sam DLC, sitting at $7 instead of $10 but that discount comes with an unfortunate catch. This new DLC is even shorter than the last. I was able to run through the entire story in just around an hour, which came as quite a surprise. Now granted there are more things to do like getting higher scores, finding various collectibles and all of the VR missions but for most gamers it will be a very brief ride. The biggest sin that the Blade Wolf DLC commits is the same that it’s older brother committed: it just misses out on what made the original game great. Sure the combat is fun and being able to play as a different character is nice but Metal Gear Rising Revengeance was great because of the crazy stuff you did and how over the top everything was. When you cut that out you are simply left with a short-lived add-on that doesn’t really add-on much to the overall experience. A code of the Blade Wolf DLC was provided to Pixel Related for review. Tags: Blade Wolf, Konami, Metal Gear Rising. Bookmark the permalink.